The program faculty maintains a list of minimum computing requirements for each degree. The educational focus is on the creation of new types of musical content, not on the vocational training of recording engineers or related technicians. Each curriculum strives to balance the development of artistic and creative skills with the mastery of the technical aspects of the discipline. Courses emphasize music composition, performance, and real-time interactive musical and new media environments. Alumni hold positions on university faculties, pursue various careers in the music industry, work in multimedia production and sound for video, and independently compose technologically based music. Future Music Oregon, the UO’s music technology center, is dedicated to the exploration of sound and its creation, to new forms of musical and new media performance, and to the innovative use of computers and other recent technologies to create expressive music and new media compositions. 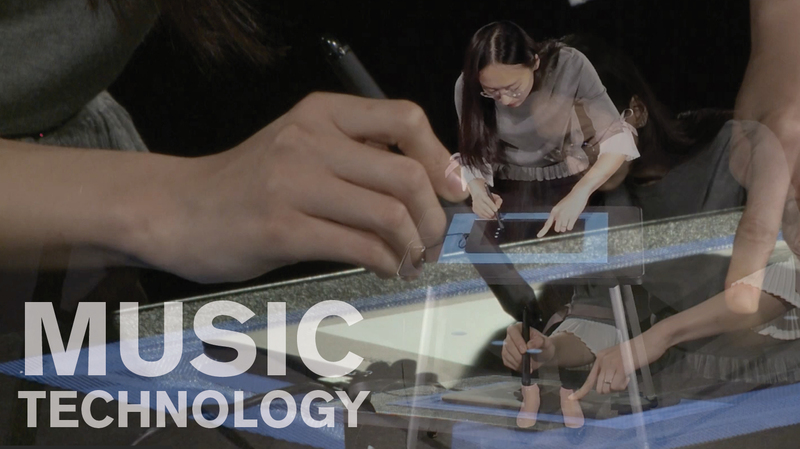 The UO’s music technology faculty members embrace dual roles, facilitating both educational and creative pursuits. Among the courses offered are Electronic Composition, Interactive Media Performance, Sensormusik, Musical Performance Networks, Performance with Data-Driven Instruments, Digital Audio and Sound Design, and History of Electro-Acoustic Music. The Oregon Electronic Device Orchestra (OEDO) employs all types recent technology to provide a unique performance experience for its members. Students enjoy the opportunity to learn from Guest artists like John Chowning, Chris Chafe, Jon Appleton, Allen Strange, Xiaofu Zhang, and Carla Scaletti. Future Music Oregon features a suite of outstanding studios for electroacoustic and new media composition that provide powerful and high-quality environments in which students learn, create, and thrive. Studios are equipped with current software, digital mixers, and game controllers and sensor-based interfaces for technological and artistic exploration. Student work is presented live three times each year as part of the Future Music Oregon concert series. Music technology students enjoy numerous opportunities to collaborate with students in music, dance, and digital arts. Each summer the UO School of Music and Dance hosts students from the top music institutes in China at the Summer Academy for Computer Music. This intensive two-week workshop examines technical and artistic topics related to music composition with computers. Past participants include students from the Central Conservatory of Music, the Shenyang Conservatory of Music, the Sichuan Conservatory of Music, Peking University, and the National Academy of Chinese Theater Arts. Contact Jeffrey Stolet form more information. Students’ creative work is presented around the country and world at festivals including the International Computer Music Conference, the Society for Electro-Acoustic Music in the United States National Conference, the Kyma International Sound Symposium, the International Conference on New Interfaces for Musical Expression, Musicacoustica, Electronic Music Midwest, the Música Viva Festival in Spain, the Re-New Digital Arts Festival in Denmark, and the Florida Electroacoustic Music Festival.